In her penetrating new study, Na'ama Rokem observes that prose writing--more than poetry, drama, or other genres--came to signify a historic rift that resulted in loss and disenchantment. In Prosaic Conditions, Rokem treats prose as a signifying practice--that is, a practice that creates meaning. During the nineteenth and twentieth centuries, prose emerges in competition with other existing practices, specifically, the practice of performance. 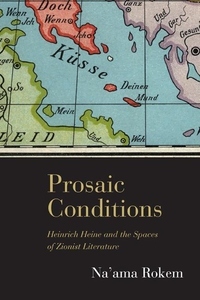 Using Zionist literature as a test case, Rokem examines the ways in which Zionist authors put prose to use, both as a concept and as a literary mode. Writing prose enables these authors to grapple with historical, political, and spatial transformations and to understand the interrelatedness of all of these changes.